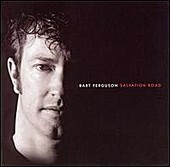 The blues tinged voice of Bart Ferguson comes off the album Salvation Road with a full sound. With too much harmonizing to be a juke joint blues, this album exposes a strong pop sensibility infested in a bluesy sound. There are several bluer tracks including the wonderful "Call Me Crazy" with it's great groove and Bart Ferguson and Carla Kendall-Bray really getting after the lyrics. "Hanging On" is another stand out song with a great beat and a fun movement. The true strength of this album lies in powerful songs nestled in the bed of a fair collection of the other tracks. I feel this is a really great early effort and look forward to seeing the future out put of this band. Rating: C.